The First Samaritan Medal for Peace and Humanitarian Achievements was awarded to Mr Bashar ElMasri, The great builder and establisher of Rawabi, the First Palestinian city. On Wednesday 9 August 2017 a distinguished Samaritan delegation came to Rawabi, the first Palestinian city, between Bir Zeit and Ramalla, for the ceremony of awarding its builder and establisher Mr Bashar ElMasri the First Samaritan Medal for Peace and Humanitarian Achievements. The priests Abraham b. Phinhas and Yusef b. Tsedaka headed the delegation, which included dignitaries of the Mount Gerizim Samaritan community: Menashe b. Tamim Altif, Yusef b. ‘Afif Altif and Chefetz b. Marchiv the Marchivi. Also present were Yithaq Altif, the Secretary of Mount Gerizim Community Committee and committee member Ben-Yehuda Altif. 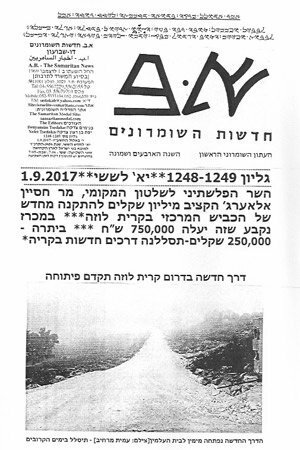 The writer of this report, Benyamim Tsedaka, his brother Yefet b. Ratson Tsedaka and Yahav Altif, also attended. The High Priest ‘Aabed-El could not come to the ceremony due to the fact that he was feeling unwell that day. The visit started with a short tour in a minibus around the new Palestininan city of Rawabi. The delegation was very impressed by what they saw. The city is still in an advanced stage development, and will be completed in a couple of years. It includes high residential blocks, shopping- and cultural centres, an amphitheatre for 15 000 guests, schools, kindergartens, gardens and an artificial waterfall. The city was built with encouragement from the government of Israel. Its shape forms a letter Q, which is the first character of the Principality of Quatar which invested a lot of money in building the city. So far the city populated to only 10% of its capacity – eventually it will host 40 000 residents. Mr Bashar ElMasri is the nephew of another great builder, Mr Munib ElMasri, also a recipient of the Samaritan Medal. In his youth the Nablus-born Mr Bashar ElMasri studied with young Samaritans. His family moved to America where he specialised in the construction of big cities. Then he returned home to help his own people . . .
. . . During the ceremony Mr Benyamim Tsedaka noted the contribution of Bashar ElMasri to peace in the region by providing the opportunity for thousands of Palestinian employees to have their own home and a good job, and to live with self-respect and dignity . . . Benyamim asked Bashar to continue his blessed work for the benefit of his own people.
. . . Mr Elmasri told the audience of his long friendship with some of the Samaritans on Mount Gerizim. In a couple of months he will head a delegation of the City of Rawabi to Mount Gerizim to look closely at some development projects on the mountain.
. . . over lunch Mr ElMasri chatted quietly and widely with his Samaritan friends. He laughed aloud when the writer told him that he is as good at welcoming guests as the Samaritans themselves.